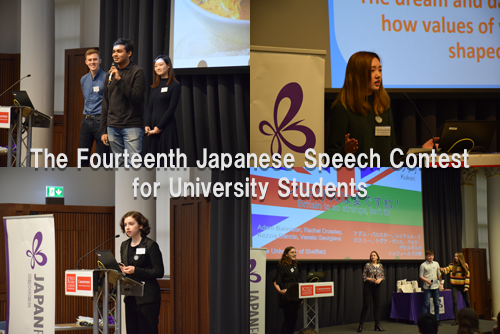 The Finals Day of the Fourteenth Japanese Speech Contest for University Students took place on 2nd March 2019 at Kings College London. The audience watched 16 speeches from finalists who had competed against students from 17 universities across the UK to get to the finals. The finalists talked about a fascinating variety of topics and the judges had a very difficult decision to make. First up was the Individual Presentation Category (post-beginner level), with five competing finalists. The first prize was won by Karolina Jankiewicz, a 4th year student at Imperial College London, for her presentation entitled “30 years of change: Poland after 1989”. Jin Hui Teh, also a fourth year at Imperial College London, claimed second prize with his presentation on “Malaysia: Racial Diversity and Harmony”. Next, the audience was treated to speeches from the Speech Category finalists. The speech Category is for students studying Japanese as either a Degree or Non-degree Course. After their speeches, the finalists had to think on their feet as they were grilled by an interlocutor asking questions in Japanese. Shuyuan (Shelly) Chen, a 2nd year at SOAS University of London, wowed the judges with her speech, “The dream and darkness of ‘idol culture’, how values of young generation are shaped by ‘fandom’” and was awarded first prize. Second prize went to 4th year University of Sheffield student, Alexander Thacker, who presented on: “The End of the Heisei: The Japanese Imperial Household System”. Finally, Callum Sarracino scooped the third prize. The 4th year student at the University of Edinburgh spoke about “’A Silent Voice’: The Power within Manga to Overcome Societal Prejudice”. The presentations of the six groups participating in the Group Presentation Category (beginner level) presentations followed. The Group Category contestants were not placed individually, but instead received prizes for their participation. The audience enjoyed talks on: “Foreign Food” (University of Bristol), “The Eastern European Culture and our Backgrounds” (University of Oxford), “Britain is strange, isn’t it?” (University of Sheffield), “Melting Pot: Are These Our Countries’ Food?” (SOAS University of London), “Loch Ness Monster” (University of Edinburgh), and “’Double Eleven’ in China”. It was a great day and the hard work and dedication of all the finalists really shone through in their speeches. Minna-san, otsukaresama deshita! Videos of the speeches - coming soon! We would like to thank all participants, their teachers and supporters, the judges, audience members and BATJ for making the contest such a success. In addition, special thanks must go to the generous sponsors: Central Japan Railway Company, Connect Job, Gendai Travel Limited, The Great Britain Sasakawa Foundation, Japan Airlines, Japan Centre, JP BOOKS, King’s College London, NHK Cosmomedia (Europe) Ltd., Ningyocho IMAHAN, Nikkei Europe Ltd., Oxford Brookes University, Regions, Ricoh UK Ltd, Toshiba of Europe Ltd, Wagashi Japanese Bakery /sister company of Kitaya in Japan, ZOOM Japan. We would like to encourage as many undergraduate students of Japanese language as possible to apply for next year’s contest! Finally, students still at school may be interesting in applying for the Nihongo Cup Japanese Speech Contest for Secondary Schools, the deadline for which is Fri 22nd March 2019. This year the Japan Foundation London will carry out our Survey on Japanese Language Education in the UK. This is part of the Japan Foundation’s worldwide survey that takes place every three years and aims to find out about the state of Japanese language education around the world. 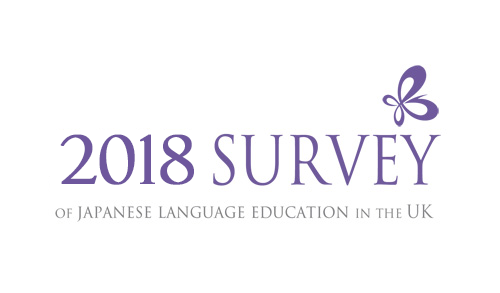 In the beginning of October, we will send details about this survey to every school and institution that we think teaches Japanese as a foreign language. If you know of any institutions that have recently started teaching Japanese, please do let us know by contacting survey@jpf.org.uk, so that we can include them in this survey. We need to have an accurate idea about the state of Japanese language education in the UK. We hope this will enable us to find better ways to support both teachers and learners of Japanese. Kansai is a region in the west of Japan famous for its delicious food, fascinating history and distinctive dialect. 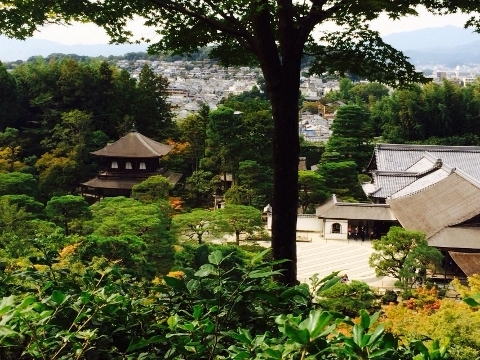 Lively Osaka, beautiful Kyoto and deer-filled Nara are just some of the many places to visit in the area. 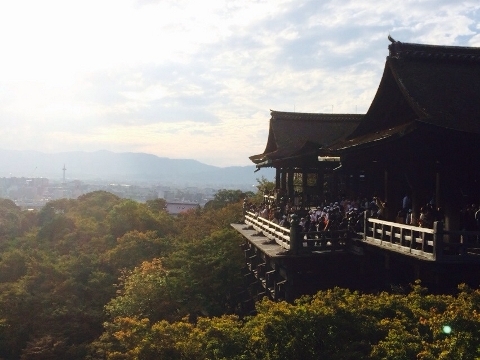 Two photographs of gorgeous Kyoto. To find out more and get started speaking the Kansai dialect, click here! 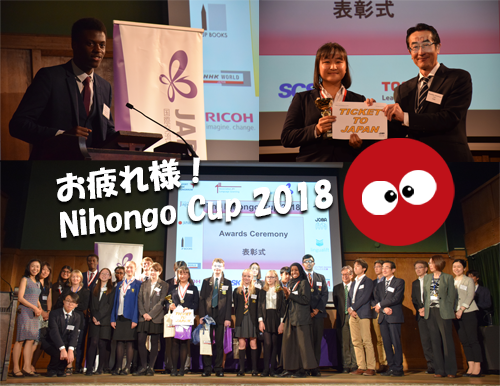 The Finals Day for the Nihongo Cup Japanese Speech Contest for Secondary School Students 2018 was held on 16th June 2018 at Conway Hall in London. It was a fantastic day full of learning, laughter and even a few tears. 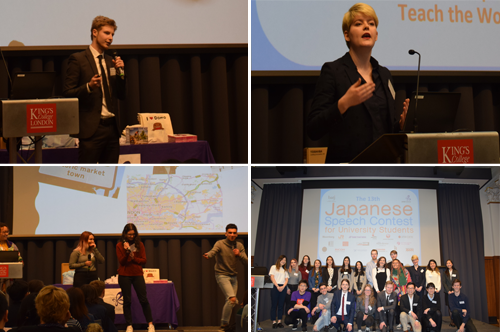 Students from across the UKs wowed the audience and judges with their entertaining, informative and often moving speeches, ranging from subjects such as wagyu (Japanese beef), Greek mythology, Japan’s shinsengumi and the mating habits of cicadas! This year, 97 applicants from 22 different secondary schools applied for the contest. The quality of entries was a high standard, but eventually 18 finalists were selected to take part in the finals. Each and every one of the finalists showed fantastic skill – not just as linguists, but as speech-givers who can enthral their audience. First up were the Key Stage 3 finalists who each gave talks on the theme of “My Ideal Day”. The wide range of interesting speeches coming from a single topic really demonstrated the finalists’ creativity. The winner in the KS3 category was Adrian Manickarajah (Year 9) from Dartford Grammar School, who talked about going to see Japanese cherry blossoms and playing the traditional Japanese game, go. Adrian was awarded with a Kindle presented by SCSK. Second place was won by Emma Troman (Year 9) from Hockerill Anglo-European College. Like Adrian, Emma also wanted to spend her ideal day in Japan, but she chose a Japanese summer’s day rather than a spring one. Finally, Skye Simpson (Year 8) scooped third place by entertaining us all with her dream of spending the day experiencing the life of a samurai, which included waking up extremely early in the morning to study bushido (“the way of the warrior”). Next, there was an interval, during which James Long played beautiful music on the traditional Japanese flute, the shakuhachi and then it was time for the Key Stage 4 & 5 Pre-GCSE category. This category was for all students at Key Stage 4 and above who had not yet taken GCSE Japanese. This time the students were able to choose their own theme. First place went to Maryam Jaama (Year 11) from Greenford High School, for her impassioned speech on history and the legacy of war. Among her prizes, Maryam was presented with a laptop computer from Toshiba. Kiara Desai (Year 10) from North London Collegiate School swooped into second place with an informative speech on how to learn foreign languages (she currently learns five!). Timi Akinsola (Year 12) from Bexley Grammar School won third prize for his fascinating speech during which he talked about xenophobia in Japan from the perspective of a Japanese-speaking British Nigerian. Finally, it was time for the Key Stage 4 & 5 Post-GCSE Category, a category for students who are studying Japanese beyond GCSE level. Like the previous category, finalists were free to choose their own topic, but they also had to be prepared to answer questions about their speeches in Japanese. Kei See (Year 13) from Hockerill Anglo-European College wowed the judges with her speech on the shinsengumi (the military police force that was formed in Japan by the shogunate in the late 1800s) and was a well deserving of the first prize, which won her a trip to Japan and a chance to perform her speech there at the international Japanese Speech Award. Second prize was awarded to Anthony Cho (Year 12) from Harrow School, who enthralled the audience with his speech on an unusual subject – cicadas. Ethan Madsen (Year 12) from Westminster School won the third prize in this category for talking about the timely issue of Japan’s shrinking population. We would like to offer our congratulations to all of the finalists and our gratitude to everyone who helped make the day such an unforgettable experience. We are very grateful to Japan Centre, JOBA, JP Books, LinguaLift, NHK Cosmomedia, Oxford Brookes University, Ricoh UK, SCSK Europe Ltd, Toshiba of Europe Ltd and A Concept for donating prizes, to the Great Britain Sasakawa Foundation for their generous sponsorship, and to the Embassy of Japan for their support. 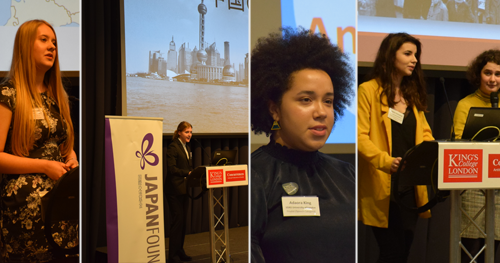 The event was organised by the Japanese Language Committee of the Association for Language Learning, in association with the Japan Foundation London. Photos from the contest can be viewed at our Facebook page here. Download the event programme with details of all the finalists, speeches and judges. Download a report of all the contest winners and runners up. Pupils enjoy a Japanese language lesson (top left). An indoor skipping workshop (top right). A brilliant taiko drumming performance in the main hall (bottom left). Pupils take part in a football workshop (bottom right). 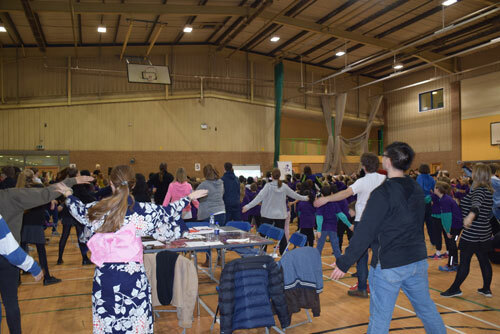 On 16th March 2018, lucky pupils from primary schools throughout Coventry took part in a day full of Japanese cultural activities and sports at the Coventry Young Ambassador Japan Conference, held at the Centre AT7 in Coventry. The purpose of the event was to celebrate the upcoming Tokyo 2020 Olympic and Paralympic Games, highlighting the links between culture, language and sport. Participants in the day's events are now Young Ambassadors who are thinking up great action plans to get schools involved in various Japanese language, Japanese culture and sports related activities in the run-up to the Tokyo 2020. The event was organised by Japan Foundation, Howes Primary School, Coventry University, CSW Sport, Finham Primary School, Stivichall Primary School and West Coventry Academy and was attended by around 240 pupils from 29 schools. The day kicked off with speeches from Mr Takashi Okada, Envoy Extraordinary and Minister Plenipotentiary from the Embassy of the Japan in the UK and Mana Takatori, Director-General at the Japan Foundation London. Five-time Paralympian gold-medallist and fluent Japanese speaker Noel Thatcher MBE then got everyone on their feet for some Japanese Radio Exercises. Everyone gets on their feet for some Japanese Radio Exercises (top). 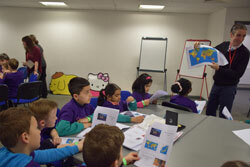 Paralympian gold medalist Noel Thatcher teaches a group of Young Ambassadors about Japan (bottom left). 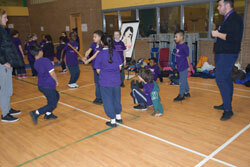 Coventry pupils try out their kendo skills (bottom right). Well and truly warmed up, the pupils enjoyed a morning of Japanese culture with workshops on: Japanese language, origami, games, sushi, manga (comic books), ikebana, Japanese clothes, calligraphy, woodcuts, using chopsticks and Japanese stories. 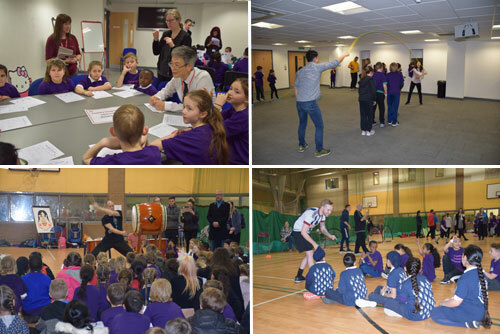 After a short break for lunch, pupils were able to take place in a number of sports workshops. These included: kendo (Japanese sword-fighting), Japanese dance, football, rugby, goalball, martial arts, skipping and taiko drumming (traditional Japanese drums). It was great to see everyone trying out so many different kinds of sports and even the teachers got to join in! Medal-winning Paralympian, Kare Adenegan, speaks about her experiences as an athlete (top left). 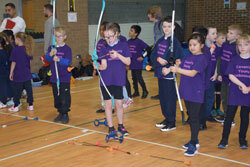 Young Ambassadors try out some archery (top right). 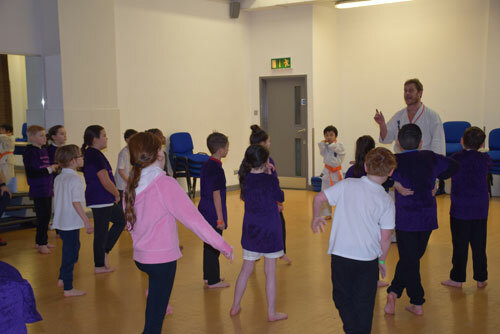 A workshop all about karate, a Japanese martial art (bottom). 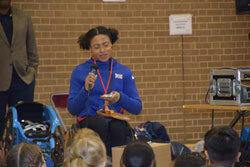 When the sports workshops had finished, everyone gathered in the main hall to hear a speech by Kare Adenegan, a silver and bronze medal winning Paralympian, who encouraged everyone to be ambitious and to dream. For many of the attendees, the Conference was the first time they had met professional athletes and it was a really special experience. We would like to extend our gratitude to Kare and to Noel for taking time out of their busy schedule to take part in the Conference. To finish off the day, pupils formed teams and discussed their action plans for Japanese-related activities to help celebrate Tokyo 2020. Pupils were then each presented with a certificate and a set of prizes. Before going home, everyone enjoyed some loud and energetic Japanese taiko drumming, which was a perfect end to a day full of activity! You can download a PDF of the event programme here! Aspire Sports, British Kendo Association, Chiba Prefecture, Coventry Building Society, Embassy of Japan in the UK, Engage! Coventry, Japan Sport Council, Kenilworth Books, Ricoh UK Limited, The Great Britain Sasakawa Foundation, The Japan Society, University of Warwick, Warwick Arts Centre and Yo!Sushi. A huge “otsukaresama deshita”* and “omedetou gozaimasu”** to the 23 finalists who took part in the finals day of the Thirteenth Japanese Speech Contest for University Students Finals Day on 24th February 2018 at Kings College London. This year’s finalists competed against applicants from 17 universities across the UK to make it to the finals. The quality of the entries this year was exceptional and the audience was treated to a series of fascinating speeches on a wide variety of topics. The day kicked off with the Individual Presentation Category Finalists (post-beginner level), with the five finalists in this category impressing the audience with their knowledge on a number of topics, ranging from diversity in Germany to the Tour de France. The first prize was won by Ellis Warren, a 2nd year student at SOAS, University of London, for his fascinating speech: “Regarding the British – The British and Racial Tolerance”. Second place was won by Sebastian Lim, a 4th year at Imperial College London, for his lively and amusing introduction to “Singapore’s Past and Present”. Next up was the Speech Category for students studying Japanese as either a Degree or Non-degree Course. The judges were extremely impressed with not only the range of topics discussed by the finalists, but the breadth of their knowledge and their ability to talk fluently in Japanese about complicated issues. Hester Mullen, currently in her 4th year at the University of Edinburgh, scooped the top prize for her speech reflecting on what she had learnt during her internship in Shimokawa, Hokkaido. In her speech “Shimokawa, the Vibrant Future City of the Forest: What a Small Japanese Town Can Teach the World” she deftly discussed wider societal issues such as environmentalism and Japan’s ageing population using Shimokawa as an example. Second Place was won by Yee Ching Chow, a 4th year at SOAS, University of London, for her talk on “Negative body image and the influence of media amongst young women in Japan”, during which she movingly and effectively talked about her own personal experiences dealing with these issues. Finally, 2nd year University of East Anglia student Yin Kwan Lao won the third prize for her fascinating discussion of the causes of and possible solutions to the “NEET” issue in Japan and the UK, “From Young to Middle-Aged: Aggravating NEET Problem and the Importance of Family Education”. After the Individual Category, the audience and judges were entertained by four lively group talks given by finalists in the Group Presentation Category (beginner level). The Group Category contestants were not placed individually, but instead received special prizes based on their chosen topics. The audience enjoyed talks on: “Alice in Ingurland, North and South” (University of Bristol), “Superstitions in Romania’s Cultural Events” (University of East Anglia), “Britain: expectation vs reality” (University of Leeds) and “Spicy!” (King’s College London). We would like to thank all participants, their teachers and supporters, the judges, audience members and BATJ for making the contest such a success. In addition, special thanks must go to the generous sponsors: Bloomberg L.P., Central Japan Railway Company, Gendai Travel Limited, The Great Britain Sasakawa Foundation, Japan Airlines, Japan Centre, JP BOOKS, King’s College London, NHK World, Nikkei Europe Ltd., Oxford Brookes University, Regions, Ricoh UK Ltd, TOP CAREER, Toshiba of Europe Ltd, Wagashi Japanese Bakery and ZOOM Japan. We would like to encourage as many undergraduate students of Japanese language as possible to apply for next year’s contest! Finally, students still at school may be interesting in applying for the Nihongo Cup Japanese Speech Contest for Secondary Schools, the deadline for which is Fri 23rd March 2018. View videos from the contest - coming soon! Japan’s Shinto religion, morals in folktales and the impact of Japanese culture on music and art turned out to be winning topics at the Nihongo Cup Japanese Speech Contest for Secondary School Students 2017, which was held on 24th June at Conway Hall in London. The 18 finalists, who had been selected from 127 applicants from 26 different secondary schools across the UK, all demonstrated great creativity, thoughtfulness and incredible ability in Japanese in performing their speeches – not to mention extraordinary courage to present their ideas in a foreign language to an audience of over 100 people! The day began with speeches by students studying Japanese at Key Stage 3, who were all in Year 9. They all had to talk on the theme of “My Ideal Holiday,” but they could interpret these theme as they wished. The winner in this category was Olivia Boutell from Hockerill Anglo-European College, who spoke about how desire to travel to Japan and see the many wonderful sights there – including visiting a cat café! Her prizes included a Kindle presented by SCSK. Samiha Rahman from Greenford High School came second with her speech – she also wants to travel to Japan to visit the aquariums there. George Amis of Bexley Grammar School came third, with his speech about travelling to Ethiopia. Next was the Key Stage 4 & 5 Pre-GCSE category, for all students at Key Stage 4 and above who had not taken GCSE Japanese. They could choose any theme they liked, and the winner was Boju Khaw, a Year 10 student from St Helen’s School, who gave a fascinating speech on Japanese and Western folktales. Boju was presented with a laptop by Toshiba, among other prizes. Coming second was Anya Burakowski, Year 11 at Wolverhampton Girls’ High School, who explored the differences between Japanese and Western Art. In third place was Patrycja Juchum, a Year 10 student from St Michael’s Catholic Grammar School, who talked about what sort of jobs she would like to do in the future. The final category was the Key Stage 4 & 5 Post-GCSE Category, for students who had taken their Japanese studies beyond GCSE level. In addition to performing a speech, they also had to answer some challenging questions about their speech to demonstrate their ability to use Japanese spontaneously. The winner, demonstrating excellent presentation skills, very thoughtful speech content on the subject of Shinto and a superb ability to answer questions, was Krishan Emmanuel, a Year 13 student at Harrow School, who won the top prize of a trip to Japan to perform his speech at the international Japanese Speech Awards. The second prize went to Amy Watson, a Year 13 student at Wolfreton School and Sixth Form College, for her speech about the vocaloid Hatsune Miku, and the third prize was won by Ruchika Ganesh, a Year 13 student at Cheney School who talked about microaggressions and racial stereotypes. Between each of the three categories of speeches, the audience had the opportunity to watch a performance of the Japanese myth of “Orochi” by , and have a go at “radio taisō” exercises! Many congratulations to all the finalists, and a big thank you to everyone who came together to make the day such a success. We are very grateful to Japan Centre, JOBA, JP Books, LinguaLift, Oxford Brookes University, Ricoh UK, SCSK Europe Ltd, Toshiba of Europe Ltd and ZOOM Japan for donating prizes, to the Great Britain Sasakawa Foundation for their generous sponsorship, and to the Embassy of Japan for their support. More photos from the contest can be viewed at our Facebook page here. You can download the event programme with details of all the finalists, speeches and judges below. Japan Foundation has launched a new course on our Minato e-learning platform: Japanese in Anime & Manga A2 (School Expressions by Scene) Self-Study Course. This is an online self-study course for learning expressions used within an anime/manga school setting. This is for people with A2 level (Elementary) Japanese ability and an interest in anime/manga. 1. Know the differences between expressions used by anime/manga characters. Learning is done interactively using videos, web sites, and quizzes. Enjoy improving your Japanese and deepening your understanding of anime and manga! Get more information and start the course for free! On the 29th of April 2017, 22 teachers attended a Primary Japanese Up-skilling Level 1 course at Bath Spa University. The course was set up by Network for Languages South West and supported by the Japan Foundation’s Local Project Support Programme grant. There will be another Primary Japanese Up-skilling Course - Level 2 on the 17th of June 2017. If you are interested in this fantastic free course, please sign up here. This event is designed for teachers who already have some basic knowledge of Japanese. A huge OMEDETOO GOZAIMASU (Congratulations!) to all 20 finalists who took part in the Twelfth Japanese Speech Contest for University Students, which took place at King’s College London on Saturday March 4th. The 20 finalists had been selected from a total of 88 applications from 18 universities across the UK. The day began with the Individual Presentation category finalists, all of whom are studying Japanese at post-beginner level. The presentations were all of a very high standard and it was very difficult for the judges to decide the winner. However, the first prize eventually went to Wei Lun Toh, a 3rd year student at Imperial College London, for his very engaging and informative speech on The History and Origins of English. In second place was Polena Lilyanova, also in her 3rd year at Imperial College London, who was also a finalist in the previous year’s contest. This year, she gave a very lively presentation on The Beauty of Bulgaria, while dressed in Bulgarian national costume! This year’s Group Presentation Category gave beginner-level students the chance to give presentations on a topic of their choice. The four outstanding groups that made it through to Saturday’s finals were chosen from an initial 17 groups that applied, and represented the University of Warwick, the University of Hertfordshire, Imperial College London and King’s College London. They gave talks on “Italy and Hong Kong,” “Songkran Festival & Tihar Festival,” “Tim Peake’s Expedition to Space” and “Culinary Customs in China and Singapore.” These groups were not placed individually, but instead received special prizes based on their chosen topics. Videos from the contest can be viewed here. We would like to thank all participants, their teachers and supporters, the judges, audience members and BATJ for making the contest such a success. In addition, special thanks must go to the generous sponsors: Baker & McKenzie LLP, Bloomberg L.P., Central Japan Railway Company, Gendai Travel Limited, The Great Britain Sasakawa Foundation, Japan Airlines, Japan Centre, JP BOOKS, King’s College London, NHK World, Nikkei Europe Ltd., Oxford Brookes University, Ricoh UK Ltd, Toshiba of Europe Ltd, Wagashi Japanese Bakery and ZOOM Japan. We would like to encourage as many undergraduate students of Japanese language as possible to apply for next year’s contest! Finally, students still at school may be interesting in applying for the Nihongo Cup Japanese Speech Contest for Secondary Schools, the deadline for which is Fri 24th March 2017. Japan Study Tour for Scotland’s Education Leaders in local Kamaishi News! The recent Japan Study Tour for Scotland’s Education Leaders, in which 20 educational professionals from Scotland visited Japan to learn about Japanese society, culture and education, was reported in Entrance, the local newspaper of Kamaishi in Iwate Prefecture. You can find the original story in Japanese here. We have provided a basic English translation of the article below. This is an unofficial translation by the Japan Foundation London produced to the best of our knowledge. We are unable to guarantee or take responsibility for the accuracy of the content. Photo 1 Caption: Scottish education professionals visited Kamaishi High School and strengthened their relations with the six students who visited Orkney last year. On February 15th, 20 education professionals from Scotland, a country with a strong tradition of rugby, visitied Kamaishi City in order to deepen their understanding of Japan’s culture and education system, as well as the current disaster reconstruction efforts. They observed an English class at Kamaishi High School (Head Teacher: Kazuya Sato, Roll: 531 pupils). They also visited the building site of a school in Unosumaicho where construction on a stadium for the Rugby World Cup in 2019 is taking place, in which Scotland has a keen interest. This visit was part of an invitation programme by the Japan Foundation (Head office: Tokyo) in response to the increasing interest in Japanese as a second language, as part of an overall strategy of Scottish education policy to introduce two languages in addition to the mother tongue languages at primary schools . The purpose is to give young people in Scotland a more globally competitive outlook for the future. The tour aimed to enable participants to experience not only Japanese language, but also the culture and the education environment of Japan and to get a feel for the potentials Japanese has to offer. The delegation, who arrived in Japan on February 12th, visited an elementary school in Tokyo and held discussions with the school community. Kamaishi High School, which has been designated by the Ministry of Education, Culture, Sports, Science and Technology as a Super Science High School, has organised visits to the Orkney Isles in Scotland as part of overseas study tour into marine energy. This occasion was a chance for the Orkney Isles to develop the relationship further by making the trip to Kamaishi City. The delegates observed 37 pupils in Year 1 in an English class. They heard the pupils make speeches about their future dreams in English. Among the aspiring teachers, nurses and accountants, one pupil said, “I want to do work that helps with the reconstruction effort. I want to develop leadership skills in order to guide people involved to do this.” Mr Wilf Weir, Executive Director for Education, Leisure and Housing at Orkney Islands Council, found this admirable. “I am impressed to see the incredible enthusiasm of these pupils. I would like to share Japan’s excellence in education with Scottish people,” he commented. The delegates also got a chance to hear about the school’s educational principles and daily life, and to talk with the six 3rd Year pupils who took part in the research visit to Orkney in September last year. After this, the delegation visited Unosumaicho. They heard about the damage situation at the building site of a school which is being rebuilt on the plateau, and learn more about the current state of the reconstruction efforts. Dr Petra McLay, Curriculum Leader of Languages & International Culture at Bell Baxter High School in Fife which has already introduced Japanese language education, was impressed by Japan’s education system and the enthusiasm of its educational professionals, but explained that there is a lack of teachers in Scotland who can promote Japanese language education. “There is a possibility we can do this if we form a regional network of schools thinking of introducing Japanese. We hope to compare educational systems and adopt the best parts,” she said. 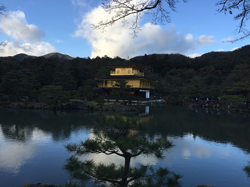 The delegation will also experience Japanese culture through temples and Zen meditation in Kyoto, and will return to Scotland on February 18th. As part of the Japan Foundation’s London’s support for links between Japan and Scotland, we will embark on a trip to Japan for 20 Scottish Leaders in Education. The trip will take place from 10th February – 18th February 2017 and will give participants the chance to learn more about Japan and the Japanese education system. We hope the programme will help deepen the participants’ understanding of Japan. It involves visiting three areas, Tokyo, Kamaishi City in Iwate Prefecture as well as Kyoto. The trip will include a wide range of activities, including lectures about the relationship between Scotland and Japan, discussions to facilitate cultural exchange with Japanese educational leaders, school visits, a visit to the area struck by The Great East Japan Earthquake in 2011, as well as cultural experiences in Kyoto. The participants are listed in the file below. These are some of the Japanese taster sessions that our volunteers in the Japanese Tasters for Schools (JTS) Programme have held in schools around the UK this year so far. We would like to thank all the volunteers for their extremely hard work on the programme! If you would like to arrange a Japanese Taster Session at your school, or if you speak good Japanese and you would like to become a JTS volunteer yourself, click here to find out more about the JTS Programme. Notes: This school has since expressed an interest in launching a Japanese club. Aims of taster: The schools has a 2 year rolling curriculum with pupils studying the book Kensuke's Kingdom, which features Japanese language. Additionally, the school holds a Festival of Culture each year when each class has a country to study. A Japanese language taster would help to support both themes. Feedback: "It was a fantastic taster day which gave the children a mixture of activities. They were able to learn lots and ask questions." 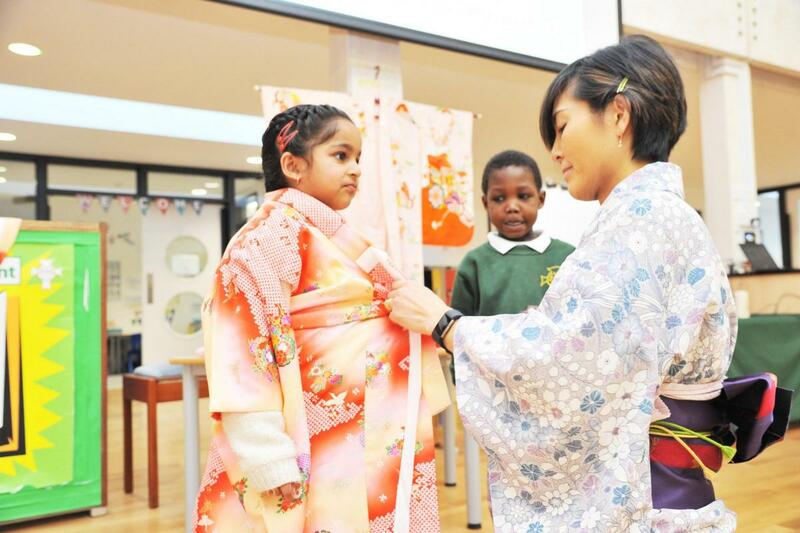 Aims of taster: The Headteacher visited Japan last October with Japan Foundation. They also have link with the local Howes Primary School , which teaches Japanese. The school are therefore interested in exploring the potential for launching Japanese classes themselves. Notes: The school are investigating the possibility of launching a Japanese club. Aims of taster: The children are currently studying the book “Kensuke’s Kingdom” which features Japanese language. The Japanese taster linked into this topic. Activities in taster: Japanese greetings, introduction to Japanese writing with song, writing some basic Japanese, learning about the Japanese festivals of Hinamatsuri and Kodomo no Hi. Activities in taster: Introduction to Japan, greetings in Japanese, numbers 1-10 in Japanese, explanation about the Japanese festival “Kodomo no Hi” (Children’s Day) and making a Kodomo No Hi carp streamer. Notes: The children are now looking forward to celebrating 'Children's Day' in May. Aims of taster: Hoping to lead towards staple Japanese enrichment activity. Feedback: “The volunteer was very approachable and delivered a great session." Notes: Following the taster, the school has expressed an interest in doing more work with Japanese language and culture. Notes: The lead volunteer for this taster, Noel Thatcher MBE, is a Paralympic gold medallist and fluent Japanese speaker who has previously supported the Japan Foundation at other events such as the Language Show Live. 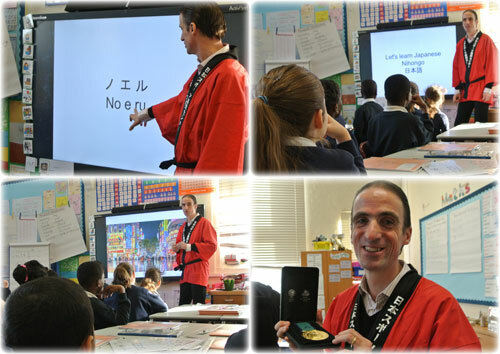 During his taster, the pupils also got to hear about his experiences in Japan and see his gold medals! Japanese taster at Holy Cross Catholic Primary School, January 2017. Feedback: " The PowerPoint produced by our volunteer was excellent and child friendly. The children were inspired to repeat Japanese spoken words by listening and repeating the language... Japanese day was enjoyed by all pupils." This primary school has been running a successful Japanese club since 2015. Since introducing the club, the number of pupils wanting to be involved has doubled, so the school applied and received a grant from the Japan Foundation’s Local Project Support Programme in 2016. You can see the full Ofsted report here. On December 5th 2016, 26 teachers of Japanese joined the Japan Foundation for a resource sharing workshop at Conway hall in London. This event brought together primary teachers of Japanese to share their ideas about what went well with their Japanese teaching over the last year. The day started with the introduction of the fantastic Momotaro (Peach Boy) play that was written and tested by Helen Morris from Madley Primary School. Participants got to see how Helen introduced the vocabulary and how she prepared them for their performance. You can see a small clip of the play here, and a performance of a Japanese dance here. The next presentation was from Clare Kuroishi, from the Norton Knatchbull School who showed how she has used kendo and rajio taiso to teach actions and parts of the body. Clare has been teaching Japanese though physical education and so it was really interesting to see how she integrated language learning with movement. Lastly, the Japan Foundation’s Chief Language Advisor Makoto Netsu, introduced some new sections of the Japan Foundation Japanese Scheme of Work for Primary Schools, which is packed full of lesson plans, resources and exciting and fun ideas for teaching primary-level Japanese to Year 3, Year 4 and Year 5 pupils. Participants were shown the topics for the new materials and then went through the new materials for teaching about shopping (including role plays). These new materials will be available to download on our website soon. You can see photos from this event on the Japan Foundation Facebook page here, and you can download some of the presentations and resources below. We would like to thank all participants for coming, especially our guest speakers! On November 25th 2016, 32 current and prospective volunteers attended a Training Day for the Japan Foundation’s Japanese Taster for Schools (JTS) Programme, in which native and fluent Japanese speakers conduct free Japanese taster sessions in UK schools. The Training Day was held at Conway Hall in London. After an overview for new volunteers about the Japan Foundation and the JTS programme itself, the participants heard reports from volunteers who had held Japanese tasters at schools via the JTS Programme. Aya Kamura Mirto on her visit to Westdene Primary School in Brighton; a taster which led to her being employed there as teacher of their Japanese club. Next, Ceri Edwards talked about her visit to Chaddesley Corbett Primary School in Worcestershire, which also resulted in the school starting a Japanese Club at which Ceri now works. These reports were followed by workshops held by two of the JTS Programme’s most experienced volunteers. Mihoko Noguchi, who has been volunteering for JTS for over 2 years and has visited 12 schools, presented some of the ways to teach Japanese in Secondary Schools, with a particular focus on numbers and enjoyable ways to teach them. She was followed by Hitomi Ito-Burton, who has been a JTS volunteer for over 4 years and has visited 9 schools, and she presented on teaching activities for Primary School pupils, including song and dance. Finally, the Training Day ended with a discussion session on ideas for teaching Japanese as a home, heritage and mother-tongue language, led by Japan Foundation London’s Chief Japanese Language Advisor, Makoto Netsu. The discussion enabled participants to exchange tips and tricks on teaching Japanese to their pupils and their own children. You can view more photos from the event on our Facebook page here. If you are interested in taking part in the JTS programme as a volunteer, please click here for more information. The Japan Foundation London is inviting travel agents based in the UK to submit their offer for the service of coordinating an organised group study tour to Japan in February 2017. The necessarily procedures and specifications can be downloaded from here. Because of the nature of the tour (i.e. most of the arrangements will occur within Japan), all the information as well as communication concerning this procedure is either provided or conducted only in Japanese. A big thank you to everyone who visited the Japan Foundation’s stand at the Language Show Live on 14th, 15th and 16th October at the Olympia, London. 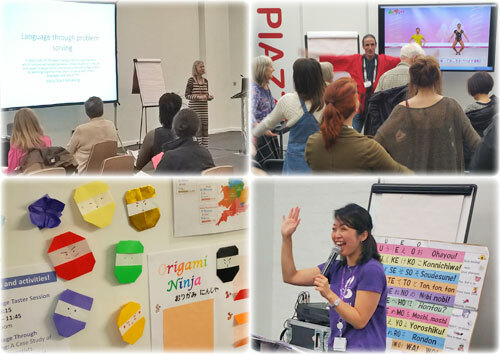 Held once a year, the Language Show is the UK's biggest event for language learners, teachers, linguists and anyone with a passion for languages. The Japan Foundation’s stand gave visitors a chance to experience Japanese language and culture, including writing their name in Japanese and making origami ninjas! Visitors also assisted by completing surveys about Japanese. 96% of those surveyed said that they were currently studying, had previously studied or were interested in studying Japanese, which is very encouraging! We also found out that a number of Japan Foundation resources, including the Marugoto textbook series, Erin's Challenge! I Can Speak Japanese and MARUGOTO+, were popular among those surveyed. Throughout the show, visitors could also have a free Japanese taster session with Japan Foundation’s Assistant Japanese Language Advisor, Kanako Ukai. On Saturday morning, we were very lucky to be joined by Mary-Grace Browning MBE, Chair of Examiners for Edexcel GCSE Japanese. She presented a seminar on learning language through problem-solving via a case study of UK-Japan Young Scientists partnerships, which involve exchanges between school students in the UK and Japan to experience science as a cultural bridge where by working together they learn to value each other’s languages and way of life. Later in the afternoon, we were joined in the Language Show’s Piazza by representatives of the Japan Sport Council, and Paralympian Gold Medallist (and fluent Japanese speaker) Noel Thatcher, to introduce Japanese “radio exercises” or rajio taisoo. First, Noel told us a little bit about what it means to be a Paralympian and the many ways his Japanese language skills have contributed towards his life. Next, Ukai-sensei from the Japan Foundation taught the audience how to count in Japanese and were then given opportunity to practise their new language skills together with trying rajio taisoo for themselves, led by Noel. You can try out rajio taisoo for yourself by watching the video and viewing more information at our Marugoto Life & Culture Lab website. We would like to thank Mary-Grace Browning, Japan Sport Council, Noel Thatcher and all our Japanese Taster for Schools volunteers who generously donated their time and expertise for the show. Domo arigato gozaimashita! Japan Foundation will also be attending the 2017 Language Show Live in London on October 14th – 16th. We hope to see you there! What made you decide to enter the Speech Contest? You got First Prize in the contest, which means you won a free return plane ticket to Japan from JAL! What did you do in Japan? Do you have any funny stories to share from your time in Japan? Haha, oh dear! So what are you doing now? Have your Japanese language skills been useful for these jobs? How has taking part in (and winning!) the Speech Contest helped you in your career? Finally, do you have a message for all those thinking of applying for the contest this year? You can read a full report from the 9th University Speech Contest here. The return flight to Japan was generously provided by Japan Airlines. What are you doing now with your Japanese? “I am currently enrolled on a Master's program at Keio University studying linguistics with a MEXT scholarship. How has taking part in (and winning!) the Speech Contest helped you in this path? You can read a full report from the 10th University Speech Contest here. Why not try yourself?! Applications for the Twelfth Speech Contest are now open – find out more and apply here. The return flight to Japan was generously provided by Japan Airlines and the JR Rail Pass by the Japan Centre. Speech Title: Norms that create reverse discrimination - Adverse effects of conventional wisdom in Japan. What did it feel like to take part in the contest and win First Prize? Your prizes included a free return plane ticket to Japan from JAL, didn’t it? Have you used it yet? What was it like flying with JAL? So what did you do in Japan? What things did you most enjoy? “First of all, I loved being back in Japan. The perfect service, the amazing food, the sights, but most importantly my dear friends there. What are you doing now? What plans do you have for the future, and will they involve Japanese? Do you have any words of encouragement or advice for students studying Japanese? And would you encourage other students to enter the contest? The return flight to Japan was generously provided by Japan Airlines and the JR Rail Pass by Central Japan Railway Company. We’re pleased to announce that the new Marugoto Intermediate B1 textbook will be released on October 1st 2016. You can get a sneak preview of the contents, sample pages and audio learning materials at the Marugoto series homepage here. 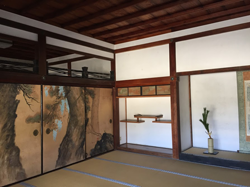 Marugoto: Japanese Language and Culture is a coursebook series that is based on the JF Standard for Japanese Language Education, and offers learning in both language and culture. New Resource ‘JF Japanese e-Learning Minato’ released! Japanese for Juniors – All About Japanese Dolls! “Japanese from Scratch: Sweet Talk Your Way in Japan” is a sweet success! Japanese for Juniors – Learn Japanese through stamp-making! Japanese from Scratch –Let’s eat Ramen! Primary Japanese Campaign 2014 – Take part! Japan Foundation to release official coursebooks in September! The New Draft National Curriculum – Fantastic news for Japanese! Ishinomaki Kodomo Shinbun English version is now live! 14th Nihongo Summit 2012 "Peace - Kizuna for One World"
UK Japanese learners top in Europe! Talking Contemporary Japan: "Squabbling Spouses - Dramatic Comedy"
East Leeds Oriental Culture and Language Conference "Kimono"
Head Start 2007 "Japanese from Scratch"
Click here for older news articles from the Mado newsletter.